From earlier reviews, we already know that Perfect Pirate makes a fine Jack Sparrow frock coat. But with some newer patterns, they also demonstrate a talent for decidedly non-Jack clothing as well. With their newest line of original frock coats, the most striking departure from the Jack look is the colors and patterns of the fabric. My own frock is made from a heavy, course-weave mustard gold, with trim in a black and gold tapestry. 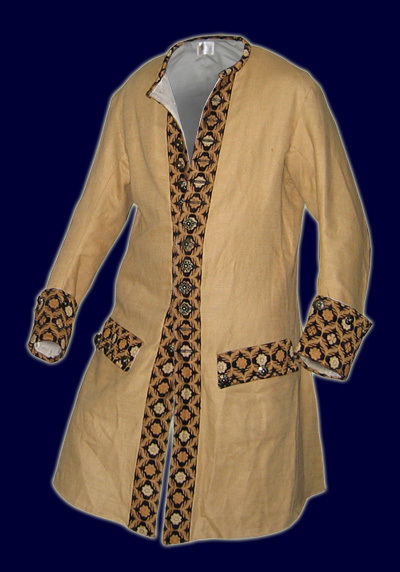 No one could ever mistake this look for a Jack Sparrow style, and the same can easily be said of the other pattern available at the time of this writing, which is a red brocade with gold trim. Either jacket lends the impression of a pirate more financially well off than the beloved Jack Sparrow – not quite a pirate king, perhaps, but at least pirate nobility. The only concern I would offer for this jacket would be the width of the sleeves – they’re a bit on the thin side, so if your arms lean towards the muscular or chubby, it might make for a snug fit. Even with scrawny arms such as my own I found the sleeves of my shirt uncomfortably grabbed at the inner lining of the coat, but this was easily remedied by unbuttoning my shirt sleeves and allowing them to harmlessly ride up my arms as I put on the coat – problem solved and perfectly comfortable. I adore my Gold Pirate Coat, and it has become a staple of my “official” Bilgemunky garb. For anyone looking to seperate themselves from the Sparrow look-a-like flock, such a jacket is a definite godsend. This entry was posted in Clothing and tagged bilgemunky's favorites, outerwear, silhouettes by Bilgemunky. Bookmark the permalink.